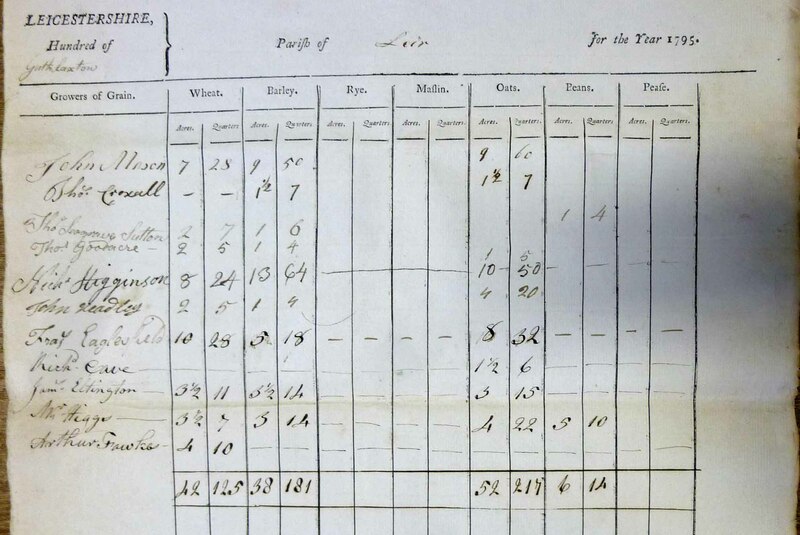 What are the crop returns of 1795? Following an apparently poor harvest and prompted by concerns about the nation’s ability to feed its people due to the scarcity and cost of wheat, in November 1795 a Select Committee of Parliament wrote to the Lords Lieutenants of all counties seeking details of the state of the recent harvest. In Leicestershire, a form was drawn up by the county magistrates, printed and given to the High Constables of the hundreds, who were asked to visit the parishes in their division to collect information about the crops harvested in 1795, 1794 and ‘any year preceding 1794’. By January 1796 they had obtained this information from 342 parishes and liberties. The 1795 crop return for Leire. Courtesy of The Record Office for Leicestershire, Leicester and Rutland, QS 28/161. Parliament was not specific about the information it required, and therefore the details collected varied widely from county to county. Some replies quoted the amount of grain harvested by weight or volume, while others chose only to mention the number of acres; some returns drew comparisons with the previous year’s crop or the last two years, while some compared the yield with an average or ‘fair’ crop. We are fortunate in Leicestershire, for the county magistrates requested details of acreages and yields for 1795 and two preceding years. The returns for all of Framland, around half of Sparkenhoe and about a quarter of the parishes in Guthlaxton hundred have survived. The details are recorded on a farm-by-farm basis against the name of each farmer (but do not give the name or the precise location of each farm). A few farmers refused to cooperate, but such instances appear to have been rare. The veracity of the figures is impossible to assess, but the 1795 figures are likely to be more accurate than those for the preceding years, which would have been reliant on the memory of each individual farmer and the farmer’s record keeping. As the question was only about arable crops, the records give no indication of the size of each farm, or the proportion of land that was arable, but by quoting the acreage sown and the yield for each crop, it is possible to identify those farmers with the best soils or the most efficient practices, as well as those who had little arable land. The figures do not include arable land left fallow as part of a crop rotation, and rarely mention arable crops other than grain, beans and peas. The list of farmers can be compared with contemporary land tax returns, which will identify whether each farmer was an owner or tenant, and will also give an indication of farm size (by the amount of tax paid, although they won’t give the acreage). That can give you an idea of the approximate proportion of arable and pasture land in each farm. 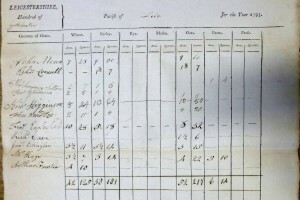 The yields quoted in the 1795 Leicestershire returns are generally given in quarters (a unit of volume – a quarter was 8 bushels, and a bushel was 8 gallons). Average yields in this period were held by contemporary agriculturalists to be 3-4 quarters per acre for wheat and 4-6 quarters per acre for barley or oats, but varied between farms and from year to year according to soil type and weather conditions. The wheat crop was particularly poor for 1795, and therefore a lower yield can be expected, and it was also a poor year for rye, although little rye was grown in the county, as it requires a light sandy soil to thrive. In contrast, the yield for barley and oats across the country in 1795 was reported to parliament as being nearly double that of 1794 and one-fifth greater than an ‘average’ year, so yields of 6 quarters an acre would not be unusual. The county copies of these returns are withinthe county quarter sessions papers held at the Record Office for Leicestershire, Leicester and Rutland. The quarter sessions catalogue lists by parish the returns that have survived (catalogue references QS 28/1-164). The Land Tax returns are also held within the quarter sessions papers (QS 62) and can be viewed on microfilm (the microfilm reference numbers for each parish are listed in the green microfilm catalogue binders). Leire was largely a pastoral parish, with just 138 acres of arable in total held between the eleven farms which grew crops. The two farms shown above were among the largest arable producers in the parish, and one might therefore expect them both to be on the better soils within the parish, but the differences in yields are striking. 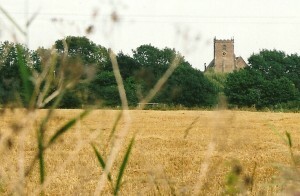 John Mason and Francis Eaglesfield harvested the same quantity of wheat, although Mason had planted only seven acres against Eaglesfield’s ten. Eaglesfield’s yields are also noticeably lower for barley and oats. Were the soils so very different, or was Mason simply more efficient? The annual land tax returns hold a clue. Mason owned no land in the parish, but rented from four owners and paid a total of £9 16s. 11 1/2 d tax, suggesting a large farm. Eaglesfield owned all his land, but it was just a fraction of the size of Mason’s farm, as the total amount he paid in tax was just 9s. 6d. While Mason’s farm must have been mostly pasture, the scale of his landholding would have required a professional approach, and perhaps the landlord of his arable land, or Mason himself, had invested in drainage to improve the heavy clay soil.